Comments: Our festival is hosted at various locations in Reston and Arlington from October 25th through October 30th. We are working on a Star Wars themed screening event BUT would love to have characters at other events as well. As we get closer to the event I can provide more details - times, locations, specific asks, etc. Tyranus has split this into two events- one on 10/27 and one on 10/29. Arrival - Walk around Reston Town Center (with an assigned volunteer) for photo opportunities with non festival attendees while the volunteer shares information and invites people to the festival. Ideally this would be 6-8PM. 5:30PM - The screening starts at 5PM. I think I would want you in place by 5:30 to present Bradford Young his award at around 5:45. Times are still changing on this but these are approximate. 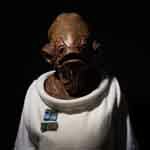 I will be going as Admiral Ackbar to the 10/27 event. Sorry Lori after reading both GT and RL forum posts I'm still lost... Where is the Arlington location and the details for that one? Actually, it looks like the only two events we were invited to were at Reston Town Center- the festival partially takes place in Arlington but we weren't invited there.